If you ask me, “How can I buy gold from a Bank?” I would first tell you “Why you should not buy gold from a Bank?” and then I’d answer the later. We all know the classic old saying, “All that glitters is not Gold”. Oh come on, am not going to tell you that the bank gold coins are not made of gold. But just the cost you pay them for the so-called high-quality Bank Gold coins is not really worth it. We Indians see gold as a privilege. Most of the gold owned by the common people are in the form of ornaments. It is sold for money when there is an emergency or extreme need of money. But when it comes to buying gold coins or bullion gold, it is mostly bought for as an Investment, a gift or children’s future marriage plan. Bank Gold Coins: Is it a good investment? Gold is a good investment in some cases. But specifically, when you want to buy the bank gold coin it is not at all an investment, rather a loss of your money for nothing more than just fancy words of the bank. Banks are promoting Gold coins a lot to its customers in recent days by promising 99.99% purity and guarantee along with a premium of some 8-10%. The bank is just a seller who is ready to say whatever is needed to compromise you to buy the yellow metal at an extra price. Be thankful to yourself for choosing to research the truth. How can I buy gold from a Bank? A Permanent Account Number (PAN) is mandatory to buy gold from the bank if the value of your gold purchase is 50,000 or more. However, to buy Gold coin of less (<50,000) value than that, PAN card or other special documentation is not required.Buying gold coins from the bank is really very simple, walk into a bank and fill in a simple KYC, pay the cash and get your Premium Bank Gold Coins with a royal packaging and walk out. But selling these coins is a hectic job and involves so much of disappointments. 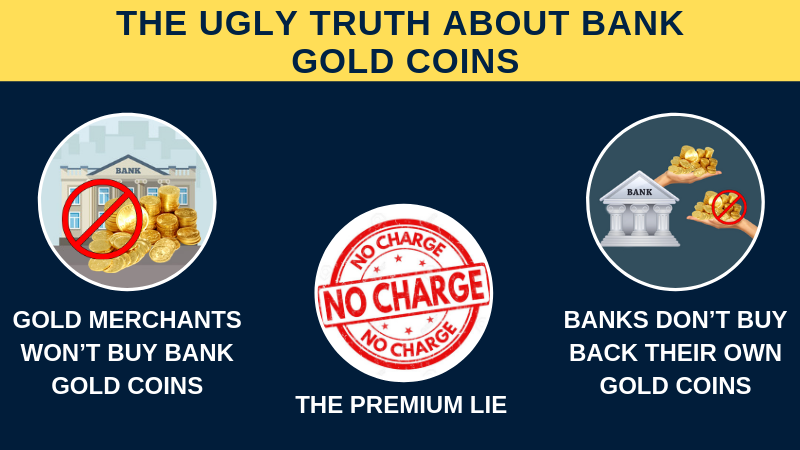 Here are the facts that can prove it is not worth buying gold coins from banks. There is no/least making charge for gold coins, but banks charge you an extra of 8-10% of the market price. The justifications they give you are the highest purity, guarantee, Switzerland import, ASSAY certification, and what not? But they are actually charging you more than the original cost and you are simply losing the money you earned. You cannot en-cash the gold coins from bank to any jeweller. If you are lucky enough to find a jeweller who accepts your bank gold coin, the price you get will be comparatively very less than the market price. Yes, you read it right. The banks will not buy back the coin they sold you. The RBI regulations do not permit the banks to buy back the gold coin they sold to you. So if you are in a situation to en-cash the bank gold coin, you have no other choice than going to a jeweller who offers the price of his own wish (if you manage to find one). You must be wondering what you would do with the high purity bank gold coin now. The only way you got is to exchange it for jewellery or sell it to a gold merchant. Even then you are going to pay the additional 10-15% of making charges or melting loss on the exchange. So apparently, you are losing your money twice if you choose to buy gold coins from a bank. The extra money bank charged while you buy the gold coin, and the money charged by the jeweller while you sell the bank gold coin. If your plan is to invest in gold or trade with gold, then the bank gold coins are not the choice. In fact, they are the least good or the worst option you could choose. An alternative way is always there, hiding in some corner. The general purpose of buying gold is either personal consumption or children’s marriage and investment or children’s marriage in future. Typically gold is available in two forms only, physical and paper gold. Physical gold denotes the gold ornaments, gold coins, and bullion gold. 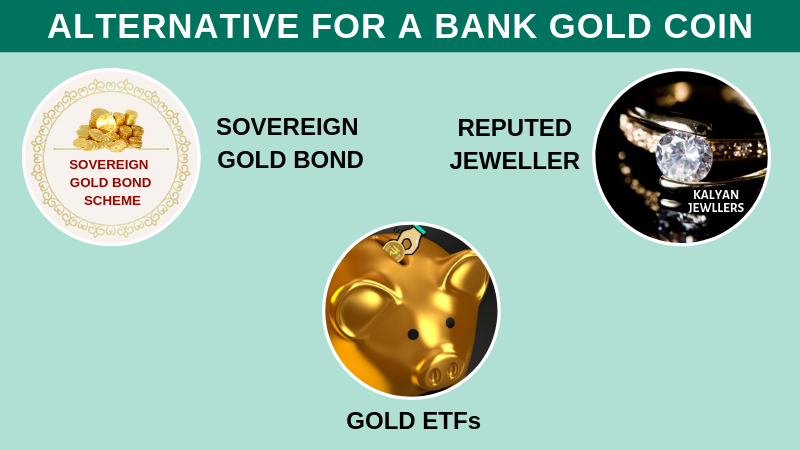 Paper gold denotes the Sovereign Gold Bonds and Gold ETF’s (Exchange Traded Funds). Sovereign Gold bond is provided by the Government as an alternate for physical gold in paper form (bond). You cannot own gold in physical form but can take part in the market differentiation in price. Thus making SGB a pure investment. SGB gives about 2.5% interest per year for your capital investment. It is also easy to en-cash the gold anytime. The capital gain tax arising on redemption is exempted. But the interest on the bonds is taxable. On transfer of bond to any other person, indexation benefits will be applied. Gold ETF’s are open-ended mutual funds schemes where investors can buy and sell units of gold in ETF’s online. When an investor buys a unit of gold ETF, gold of the same value is bought in the funds. Gold ETF replicates the movement of gold price in the market. They can also be traded for in future by options. The possession of paper gold (SGB & ETF) gives you the comfort of storage safety from theft. It also gives you transparency in price and purity. You don’t want to enter into hustle about the purity with the buyer when en-cashing the SGB or ETF’s. If buying a gold coin is your only idea, then the best option is a reputed or known jeweller. Just make sure the jeweller would buy back the gold coin at the current market price. Also keep the purchase bill safe, which will be required to verify the genuineness of the coin while selling. Unless you are buying gold for personal consumption, it is not advisable to buy gold in the form of ornaments. If you are buying gold for your children’s future marriage or as an investment then you have options like SGB, ETF, and high purity (99.95%) bullion gold from a gold merchant. 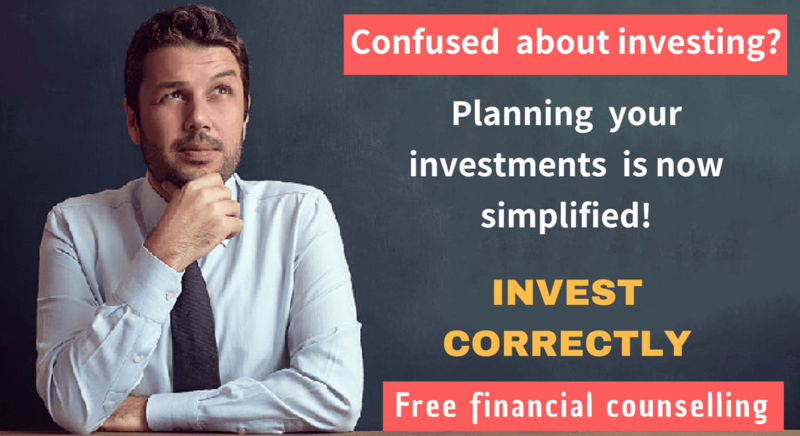 If you are only looking for an investment or generating a good return using gold, then you have a couple of more options like mutual fund investment and stock market etc. Gold is a form of wealth which can get you any currency of that value all over the globe and of course very influential. It is advisable to keep an allocation of 5% to 10% of your money in the form of gold. But make sure the value does not depreciate due to trivial reasons like buying it from a bank. Previous Previous post: Financial Planning vs Wealth Management: Which one to Choose?